Oh Yeah. The Republicans Are Going To Save Us Now! "After the last polar bear, being fed up to be used as evidence for 'global warming', has committed suicide and passed away with a warm 'F... you! ', we might begin to realize who benefits from 'global warming'! Have a sunny day!" "Our society is run by insane people for insane objectives. I think we're being run by maniacs for maniacal ends and I think I'm liable to be put away as insane for expressing that. That's what's insane about it. " "Americans will believe anything as long as it's not true." Well, the election is over and most of the results are in. I haven't tallied it yet, but as I understand it about 40 incumbents retired and of all the incumbents that ran only 4% lost their jobs. Once again, most people think there was some huge turnover in Congress and the Republicans are dancing around just like the Democrats did when they gained control of Congressional purse strings as if a new day had dawned. The Republicans are going to save us! When have the Republicans ever saved us? Has everyone forgotten what the Republicans did the last time they had the majority? SQUAT!! Well, not squat. They did plenty to create the mess we're all in. To imagine they will do a damned thing to change a damned thing is INSANE. There are a few bright spots however, one being the election of Ron Paul's son Rand Paul to the Senate. Now we have a Paul in the House and in the Senate! Another bright spot is the appointment of Ron Paul to be chairman of the banking oversight committee! It is going to be plenty fun to see what he does with that new power. I can't think of anyone better in charge of the banking oversight committee than the man who wrote, "End the Fed." Repeat After Me . . . NO MORE CAREER POLITICIANS! "God forbid we should ever be twenty years without such a rebellion. We have had thirteen States independent for eleven years. There has been one rebellion. That comes to one rebellion in a century and a half, for each State. What country before ever existed a century and a half without a rebellion?" "The spirit of resistance to government is so valuable on certain occasions, that I wish it to be always kept alive. It will often be exercised when wrong, but better so than not to be exercised at all. I like a little rebellion now and then. It is like a storm in the atmosphere." It's absolutely dumfounding why anyone would consider allowing any career politicians back into public office, especially one who is named after a lizard . . . which is not very far from being a snake! Oh that's right, he is a snake! In case everyone has forgotten, just about every single career politician is a snake! It's also dumfounding because I believe most people know career politicians cannot be trusted any farther than you can drool down your chin. If you're someone who would say, "I like Newt," perhaps it's time for a little self-psychoanalysis. Why the hell is that so? It can't be because he's actually worthy of fondness. It has to be because, once again, Newt is a great performer and he has absolutely no problem acting charming and sincere all the while looking you right in the face and lying to you without blinking an eye. 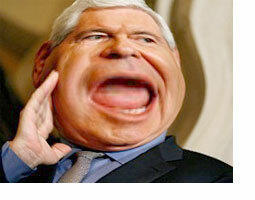 Remember, Newt has been a career politician for over thirty-one years. He was reprimanded with ethics sanctions when he was Speaker of the House by a vote of 395 to 28. Roughly a year later he ended up stepping down as Speaker and left the House as well. Let's not forget the bizarre ad in which he sat with the equally snake-like Nancy Pelosi for an ad campaign aimed at conning us all into believing the fraud of man-made global warming (watch it here) so the same snakes could tax the living crap out of everything and everybody in the name of reducing our carbon footprints. Perhaps the choicest moment for our loveable Newt came when he decided it was a good idea to hand divorce papers to his first wife, Jackie, the mother of his two daughters, as she lay in her hospital bed after uterine cancer surgery. Yes, Newt is another fine example of someone we should keep putting in the mix of useless politicians that dutifully do the bidding of those in real power, the bankers and their corporations that have become nothing but a public menace. Yeah, that makes perfect sense. We love Newt. He's just so cute. WHAT . . . ME WORRY? 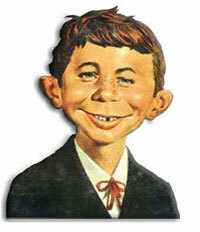 Alfred E. Newman, the poster boy for the average American? I'm afraid he is. Far too many people in this country are happy to trundle through their lives oblivious to what's really going on around them just underneath the surface. As long as their cable and HD flat panel TV's are delivering the finest viewing pleasures known to man, as long as they can get their Kentucky Fried Chicken and the beer flows freely, all is well in the good old U.S.A. Problem is, we don't live in the good old U.S.A. we think we live in. We live in a MAD, MAD, WORLD! I've read that the same phenomenon that is occurring in our nation right now occurred in Germany just before Hitler came to power. While most had an awareness that things were bad, it really couldn't be seen in any outward appearances. Day to day life seemed relatively normal. Then suddenly, literally just about overnight, you had to belong to the Nazi Party just to get or keep your job! It happens that fast. To all you Alfreds out there I say, YES, it's time to worry! After the last newsletter I was told by some readers that it's not productive to just bash everyone. I'm so tired of hearing things like that. Comments like that do nothing but obfuscate the entire substance of what I've said. Comments like that render my newsletters into nothing but mindless negativism. I had one person say they didn't like my Pelosi bashing. 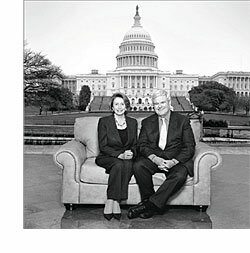 Pelosi bashing? All I did was highlight something she said. All I did was point out that she voiced her utter contempt for the Constitution by the words that came our of her own mouth. Don't believe it? Listen for yourself right here. I just don't understand why anyone would feel the need to defend anyone who voiced such a thing much less to defend the Speaker of the House for voicing such a thing! On the page linked above you will find the audio of her comment as well as a video clip in which Pelosi totally ignores another serious question about the provisions in the Health Care bill she crammed down our throats. She makes it very clear she doesn't give a crap what we want by totally ignoring the question about a provision in the bill that states you can be thrown in jail if you don't buy insurance. What was said about Sarah Palin shouldn't be discounted out of hand as bashing either. She has become a major player on the political landscape and is fomenting the same "cult of personality" that Obama whipped into a frenzy. 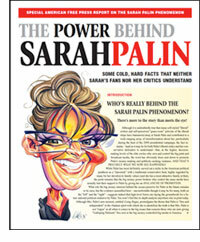 Here's a new series of in-depth articles on "The Power Behind Sarah Palin" that I encourage everyone that's dreamy-eyed over Palin to download and read. There is also an audio presentation by the author on the page. Sarah Palin is not in the position she's in because, "she's one of us." She's in the position she's in because the people in power put her there. I have to giggle when people say, "she's one of us," as if that's a good reason to support someone. Folks, it's not necessarily a positive thing to say, "she's one of us." The vast majority of us are very easy to corrupt. If someone approached any one of us with an offer to make to make us rich, famous and powerful quite a few of us would be hard pressed to resist. We all know we would have to compromise our integrity quite a bit for that big paycheck and glory. I'd be willing to bet FAKE Federal Reserve money that quite a few of us would grab the brass ring in a heartbeat. We love to think we're beyond such things but remember another famous saying, power corrupts. The sad reality is, we really do get the government we deserve. In many ways we do have a representative government. Sad truth is, many of us wouldn't hesitate to sell out for a big bag-o'-cash. It's Time To Be Bold and Prepare! "You know, the very powerful and the very stupid have one thing in common. They don't alter their views to fit the facts, they alter the facts to fit their views, which can be uncomfortable if you happen to be one of the facts that needs altering." - CIA operative discussing with Philip Graham, editor Washington Post, on the availability and prices of journalists willing to peddle CIA propaganda and cover stories. "Katherine The Great," by Deborah Davis (New York: Sheridan Square Press, 1991). The Psychopathic Global Control Freaks That Are Smashing Us Into Their Sick Idea of A Perfect World? I'm fairly certain that most of you who are aware that our nation is at a terrible crossroads. In fact, the world is at this same crossroads because the lunatics in power have their sick tentacles spread all over the planet. They have infected every major area of life from our food supply, to our school system, to the government, police and of course the global financial system. Some people write to me accusing me of being "EXTREME RIGHT" and they just can't take it. Well, it's funny. I think a more accurate description would be I'm "EXTREMELY RIGHT," "EXTREMELY CORRECT," and they can't face the truth of things. Anyone who has taken the time to read what I write will know that I'm not politically oriented. You will NEVER find me endorsing any party ideology. I'm sick of the whole ridiculous song and dance. I've said for a long time that the primary questions that everyone needs to ask themselves is, "Do you think the Constitution is a good idea or not and do you think the idea of a Constitutional Republic is a good idea or not?" It's astounding to realize that far too many people in this country believe our form of government is supposed to be a democracy. It's not. We are supposed to have a Constitutional Republic. A democracy is five wolves and a sheep deciding what to have for dinner. A democracy makes it possible for 51% of the people to take away the rights of the remaining 49%. A Constitutional Republic ensures that 99.9% of the people CANNOT vote away the unalienable rights of .1% of the remaining people. The Constitution and Bill of Rights delineates these unalienable rights that NOBODY can take away. A Constitutional Republic is five wolves and a sheep that is armed with a shotgun deciding what to have for dinner. If everyone would focus on those two questions we might could actually get somewhere. Until those questions are answered, we are going to be stuck with a bunch of people in charge that have clearly made up their minds. They do not think the Constitution means a damn thing and they most certainly don't think a Constitutional Republic should be our form of government. They think we should live under Corporate Colonialism with Rulers and Peasants . . . oh, and of course slaves - that's you if you didn't know. "The argument that the two parties should represent opposed ideals and policies, one perhaps of the Right, and the other of the Left, is a foolish idea acceptable only to doctrinaire and academic thinkers. Instead, the two parties should be almost identical, so that the American people can 'throw the rascals out' at any election without leading to any profound or extensive shifts in policy.... Either party in office becomes in time corrupt, tired, unenterprising, and vigorless. Then it should be possible to replace it, every four years if necessary, by the other party, which will be none of these things but will still pursue, with new vigor, approximately the same policies." Yes, indeed. I have a bit of a reprieve from my bank battle and there's just so much happening that I felt the need to keep it rolling! Why Do So Many Fall For These People? It absolutely confounds me why so many people fall for the STARS that the powers-that-be prop-up in front of us. How can otherwise bright, intelligent people become stupefyingly lame-headed and suckered by people that are clearly just saying exactly what everyone wants to hear? It happens over and over again. Once they are elected, they do nothing for us! Duh!! Why do you think that is? Could it be that they never gave a damn about us to begin with? Could it be that when those in power offered to "make them rich and famous" and that they may have been seduced? No, that couldn't be it. Not our precious fill in the name of your favorite savior here. The sad fact is many of us have been socially conditioned to idealize celebrity! It astounds me how easily people will glom onto someone and idealize them beyond any reasonable proportions. How many of our so-called leaders turn out to be worthy of our adoration and idealizations? How many discredited, corrupt political stars can look right into a camera, right into your eyes, smile and LIE without a second thought? That's why they pick these people. They can do this without any trouble whatsoever. Oh, but not Obama. He would never do anything like that. Sarah would never do anything like that. They are real. They are genuine, right? You just "know" they are by what you've seen on TV, or heard at a rally you saw her at. Or my God, she actually spoke to you personally at a rally. She seemed so real, so nice. I think I may have to projectile vomit. Please excuse me for a moment . . .
Can you detect a bit of ire in my tone? I'm just so tired of seeing good people act out the same stupid behavior. There I said it. I said the "S" word. Another strange thing that happens to many of us is when we see someone often enough on television we start to feel that we know them, as if they are a friend. Familiarity is not the same thing as friendship everyone. Friendship requires an actual relationship. Can any of you really say you know a darn thing about Palin or any of these people propped up before us? You only know what you've seen and heard through the media. Their sound bites are carefully orchestrated and controlled. Some people were offended because I put the photo of Obama and Palin dancing in the campaign video. Nobody seems to have a problem with Obama being there, but "How dare I" put Saint Palin in with him! She's the real deal. She's "one of us." Did any of you notice that Sarah Palin came out of nowhere just like Obama came out of nowhere? Suddenly she was thrust into the limelight with the full might and power of the establishment celebrity machine. She was everywhere and still is. They made her a star overnight and dazzled everyone inclined to be dazzled by her. She's gone from total obscurity to a multimillionaire folks. Do you really think they would have picked her if she wasn't going to serve their purposes? There is no difference between what they did with Obama and what they are doing with Palin my friends. Look at that photo to the left. Look really hard and next time you watch Sarah, see if you can't see that this is exactly what she is doing. She's a performer. She's being paid a lot of money to do what she's doing. She's telling you exactly what she has been told you want to hear, what will sucker you in and make her more famous and powerful. Yes, she may believe some of what she says but make no mistake. She is not going to help us! Everyone who is gaga for Palin will see she won't deliver any better than Obama if she actually gets elected to anything. She is surrounded and controlled by the same "old guard" that's been in the primary "appointed" positions of power and advisory positions since Kennedy was assassinated. You've probably noticed I haven't written a newsletter in quite some time. It's a bit longer this time because of it. I hope you find its extra length well worth it. You'll find this newsletter puts our current economic disaster into a perspective that you'll not find anywhere in the mainstream media. For those of you who have read past newsletters, you know I've been battling OneWest Bank over my home. I'll fill you in on that saga in a moment. Right now, I'd like to announce that I've created a new, powerful campaign video that I need your help to make it go viral. This video could easily put our campaign on the map! I took a popular video called "America Rising," a well-produced video except it's ridiculously partisan. It's a Republican video that demonizes the Democrats . . . as if Democrats are the biggest and only problem there is. I edited it to present the truth of things. Both parties are the problem! 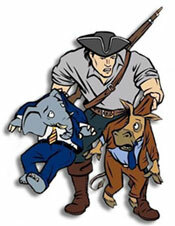 Both parties are responsible for selling us out to the criminal global banking and corporate cartels. Please help make this video go VIRAL! Send it all your friends and family. You've probably noticed that I've gotten quite behind on producing these newsletters. All I can say is fighting a bank that is trying to illegally steal my home is a full time job that has just about sucked the life out of me. This fight has been the hardest thing I've ever done in my life! For those of you who are new to this drama, I've been fighting OneWest Bank. OneWest Bank has been trying to steal my home through outright fraud for the last seven months. They have presented themselves as the new owner of the original loan I took out with IndyMac Bank. IndyMac Bank was closed down by the FDIC in July 2008. The FDIC ran it for a while then turned over its operations in March of 2009 to OneWest Bank. OneWest is a new, privately held bank formed by the likes of George Soros, Michael Dell, a former VP of Goldman Sachs Steven Mnuchin and other Wall Street insiders. OneWest Bank is arguably one of the worst, most predatory banks to hit the scene if you can even imagine banks being more predatory than they already are. Check out the sweetheart deal these guys made with the FDIC here and check out the profits these predators have racked in already . . . $1.6 billion! If these profits are the result of what OneWest Bank is trying to do to me, they are making all this money through pure unadulterated FRAUD. They are stealing homes they do not have any financial interest in whatsoever. Check out this screen shot from the FDIC's own website stating that OneWest Bank only owns 7% of the loans they service! If my case is the norm, OneWest is stealing people's homes all over the country right now. 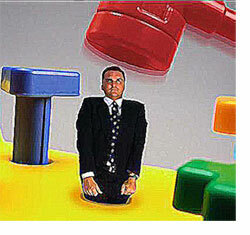 BANKSTERGATE . . . The Best Way To Start A New Year Ever! The new year could not have started on a better note. It appears as if the tide is continuing to turn against the criminals responsible for pushing our nation to the edge of ruin . 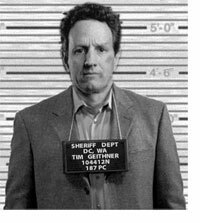 . . the criminal global banking cartels headed up by the likes of "Terrible Tiny Tim Geithner." People like Geithner, Henry Paulson and Ben Bernanke strut around in their expensive suits . . . but make no mistake. They are criminals of the worst kind. They prance around right in front of us, lying right to our faces and robbing us blind. Here's what happened at the beginning of this year. E-mails from AIG (American International Group), the New York Fed, the FDIC and others were obtained by Representative Darrell Issa, ranking member of the House Oversight and Government Reform Committee. These emails revealed AIG was instructed to hide information that it paid banks, which included Goldman Sachs Group Inc. and Societe Generale SA, 100 cents on the dollar for credit-default swaps they bought from the firm. Watch this video segment with Judge Anthony Napolitano and Ron Paul for the whole story. The sad fact is bankers have achieved a hostile takeover of our government. They have always run the Congress but now, it's right out in the open for all to see. Wall Street insiders are everywhere. Our last two heads of the U.S. Treasury have been the former head of Goldman Sachs and the New York Fed for crying out loud! Because Wall Street has so much control of our government at this point I'll have to agree with Ron Paul when he said to Judge Anthony Napolitano that not much is likely to come out of the hearings scheduled to investigate these emails. That is why we must make sure everyone we know is aware of this story and keep pushing for an audit of the Federal Reserve. We have to keep the awareness of this alive and keep pressing the issue in every way that we can. The people that control the money, control just about everything, especially our government. They own all the major industries and the media empires. If we do not take control of our money away from these robber barons we will not be able to stop what's happening. Climategate . . . The Best Christmas Present Ever! CLIMATEGATE - The Best Christmas Present EVER! 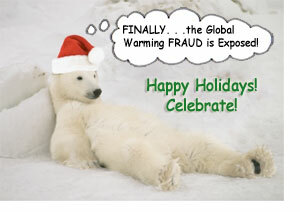 If you haven't heard, the hoax of man-made global warming is finally out of the bag and there's no putting it back in! The primary research institute responsible for the studies and climate models used in the Intergovernmental Panel on Climate Change (IPCC) reports on global warming being man-made, had it's files leaked to the public. Emails, documents, computer code for the software that created the climate models . . . the whole ball of wax was dumped onto the public stage. The documents prove beyond a shadow of a doubt that the whole man-made, CO2 drives global warming scare was and is a deliberate fraud on a scale that's unimaginable to most people. Finally we have undeniable evidence that frauds of this scale are not only possible . . . here's one right here! The next logical question that occurs to most people is if they've lied to us about this, what else have they lied to us about? Of course, the criminals behind this massive fraud also control the mainstream media so they are doing their best to prevent most people from finding out about Climategate. When they do have to speak in public about what was leaked they are going to great lengths to deny it means anything. They have gone so far as to say even if the science they presented as "indisputable fact" is flawed it doesn't mean their conclusions about climate change are wrong. In other words, they are doing what they do best. They're lying through their stinking teeth. It's not going to work this time. I predict that Al Gore will eventually have his Nobel Prize ripped from his filthy hands and he and his cohorts like Maurice Strong will be hauled off in a lovely orange jump suits, dragging balls and chains attached to their ankles! It couldn't be soon enough for me! I feel as if Climategate is heaven sent, a true miracle. To me it's a shining example of how any one of us can make a miracle happen, how one person's actions can change the world! This is a perfect case that illustrates the saying, "God helps those who help themselves." Someone, some courageous individual leaked these files and I believe it will lead to the downfall of a tyrannical world government that has been methodically put in place over decades right under our noses. One single act of bravery can bring down something that is systemic and seemingly unstoppable. The proverbial "one tiny screw" that holds the whole behemoth together can be unscrewed and popped out of it's hole! Climategate is the screw and it's out of the hole! The American Dream Is More Of A Dream Than Ever Before! Ah! . . . the dream. The American Dream. Sadly it's much more of a fixture in the dream world than the real world and it's getting more so every day. 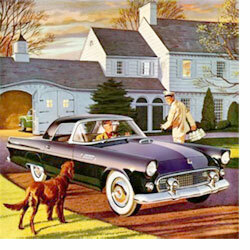 The original American Dream was a simple dream, a dream for a life in the middle class. It offered the possibility to rise to any height if you worked hard enough but mostly it was a vision of a life where you could have a nice home, enough money to raise a family and a life of leisure in your waning years. I'm sure most of you have noticed the ruling class has had enough of that so they are now wiping out the middle class and the American Dream right before our eyes. 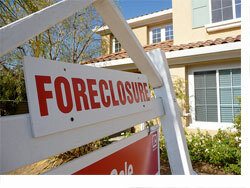 One of the prized goals of the American Dream is owning your own home and your own property. Our nation gave birth to the largest middle class in the history of the world and as a result we became the most powerful nation on the planet. 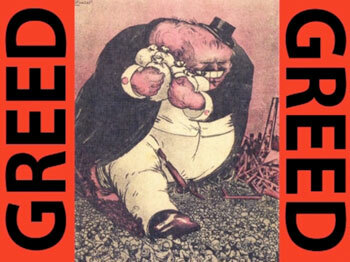 Unfortunately the ruling class has a problem with a large middle class. A large strong middle class has power and this is the exclusive domain of the ruling class. So, the ruling class had to do something about it. One thing they did is distort the meaning of the American dream. The American Dream has become what the ruling class dreams for us. And their dream for us stinks! It has become the description of how the ruling class sees life and their relationship to everyone else. The American dream has become one where you step on everyone and everything you have to in order to rise to the top of the heap. It's time to remind everyone that this is not the real American dream. The real American dream is a dream of a good life for everyone, a decent job and the ability to live our lives free of other people telling us what we can and can't do. Most of us have no need or desire to "have it all." We just want enough to live a comfortable, simple life.